OK, I haven’t played The Sims 3 in a while, but it’s time to break out my sim-self and send her on a tropical vacation, with lots and lots and lots of swimming! Isla Paradiso, here “I” come! Seriously, seeing a pixelated version of myself doing awesome things without being shamed for it (because body shaming does not actually happen in The Sims 3 unless you have some sort of weird hack for it – it is not in the code), makes me feel great! I’m not very able-bodies, never was, so I can’t actually go scuba diving, and I’m too poor to afford it, but gee, I sure can visualize it. I wonder if I have a thong swimsuit option in the game? After reading this, I need to check, although normally, in real life, I’m a one-piece swim-dress sort of woman, because of modesty issues. But then, in the Sims 3, uncontrollable lust at seeing a less-than-fully-dressed woman is also not in the code. Also, something I love about this particular game is that if you start fat, and lose weight, the weight will slowly come back, if you don’t keep at it every day. You know, like real life and Science! So even if I “get my swimsuit body by summer,” it will be gone by fall. Except that it won’t, because my sim-self will be in a swimsuit from DAY ONE!!!! YES! In other words, gentle readers, do what works for you to psyche yourself up for body love and acceptance. This works for me (although sometimes I have to go back for a “booster shot,” as it were, as the slings and arrows of outrageous society beat me down again). Your mileage may vary. I want to hear what the other readers here do to psyche themselves up. Drawing? Photography? Dancing naked in the bathroom in front of the full-length mirror? Even at my lowest, I always felt beautiful when I was dancing. I love Ragen’s suggestions, and I want more. I read multiple reviews of The Sims 3 actually complaining about how the fat comes back, and how “unrealistic” that is, because “everybody knows” that weight loss is permanent, unless you pig out and do all the wrong things again. But here this game is, making you gain the weight back, simply by existing in your body, even if you don’t ever fill up your hunger meter all the way. And yet, how realistic it is that sims who start out thin tend to get thin again, if they are not pigging out every day. They don’t really have much in the way of ill-ness and disability in the game (although, there are some awesome mods out there, specifically for that! Use at your own risk, for coding conflicts), so PCOS and other fat-causing diseases/syndromes/etc. are not things in this game. The only way for a naturally thin sim to get fat is to stuff themselves. But if they don’t stuff themselves every day, their genetics win out, and they get thin again, without ever having to do cardio. I don’t know if they changed it, or how they changed it in Sims 4, because I don’t play Sims 4, but whoever did the coding for Sims 3 got it RIGHT! Maybe they read your site? I do photography. I’ve been buying a lot of cowcow dresses (unicorn, cats in space, desserts, ice cream, cat face with polka dot skirt, plus a donut bathing suit) and when I get them (I order from Amazon) I get out my Nikon, set up my great-grandpa’s tripod, go outside in front of my brick wall on my house and take shot after shot using the smile timer (that takes photos when you smile at the camera). I always end up with a few photos that turn out great that I can post to instagram and my fat acceptance group on Facebook and to my profile on Facebook. It makes me feel great. When I got my first unicorn dress I was really shy about wearing it in public, because it’s kooky and its bright pink, but I just started wearing it out and I got to loving everything about wearing these wild dresses in public. My advice to anyone worried about wearing that dress or going to that beach or wishing they had the confidence that they feel like other glorious fatties exhibit, is fake it til you make it. Wear the dress. Then wear it again. In my case I got lots of compliments on the dress (because…. Unicorns!) and I just kept going. Of course I do think I’m very privileged because I don’t live in the city and I live in Tennessee, so I think there is much less overt fat hate in my area. I hardly ever encounter it, and I wear a 4x in most things. Sometimes I can fit in a 3x. I also think I fit closer to the societal expectations of beauty, and maybe that’s why I don’t get harassed. Ooh, nice! Makes me want to find my camera. Now that I think of it, the latest picture of myself is from my father’s funeral, some years ago. I love setting up photography sessions for myself. I also had to do this to teach me how to smile again because I have full dentures and I had terrible teeth for years and got to only smiling with closed lips. It felt so forced and to me it looked very fake and forced when I smiled for pictures after getting my dentures, but using the smile timer on the camera has forced me to make big smiles at the camera until it recognizes a smiling face and eventually it started feeling natural and looking natural to me. I got my full bottom dentures at a different time than my uppers so I had to go through the learning experience twice. I just hated how my bottom dentures changed the look of my face when I was wearing them. Now I wear them all the time and take pictures if them all the time and I think my smile and face looks great. That’s great! There are a lot more ways than just fat that society tells us we are not good enough, and we need to find ways that work for us to embrace all those parts of ourselves, and see the beauty that others can’t or won’t see. Because that beauty IS there! I KNOW THE SECRET TO GETTING A BEACH BODY LADIES!!! Have a body. Go stand on a beach. You now have A BEACH BODY! Yay sign me up(and then come get me,I don’t drive.)! Truthfully, I am just under 400 pounds and a bathing suit is hard. BUT I would put up with just about anything to go swimming! This is so smart, I lived almost my entire life in Southern California and went to the beach maybe 2 dozen times. If I would has been just more like this I would have enjoyed myself more. 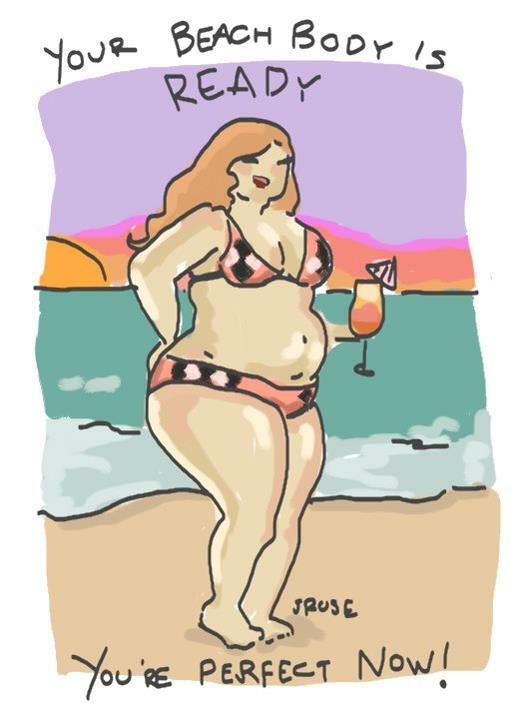 I truly love your common sense about having a beach body! we all need to just worry about whether we’re having fun and that nobody is drowning- that’s pretty much it! When I’m at the lake, sometimes I just strip to my undies because I didn’t plan to swim that day. My mother is horrified but frankly I don’t want to miss out because my clothing isn’t technically a bathing suit. As to other people- let them think what they want- it only shows their level of prejudice and sometimes sadly society makes us think that way and it’s hard to find a way out of that box. When I was 20, MANY years ago I remember so clearly feeling outraged that a woman dared to rock a bikini “at her size”. I wasn’t much smaller mind but at least I had the decency to cover up more. I shake my head at how young and brain washed I was- these days I am her (especially at the lake:) and I celebrate how far I’ve come. thanks for all your great words and simple common sense. I want practical summer advice. How old can your sunscreen be and still work? How much should you use (a lot!)? How do you cross the hot sand between your blanket and the water? How do you get said sand off your feet when you get back to your blanket? If you are at a lake without a sandy beach, how do you cope with the gooey lake bottom and all the seaweed (lakeweed?)? Not beach related, but what do you do when it’s hot out and your animals want to snuggle? Swim shoes are absolutely wonderful! Hot sand? Not a problem. Gritty concrete at the pool? Not a problem. Sandy shoes? Slip them off and your feet are clean. I think you can use it up to a year after the expiry, but we have some that is older, and it still works, but probably for less time. If you’re going out for 4 yrs, neither old nor new would work, as you have to keep reapplying, but for 30 mins, I wouldn’t worry too much about it.